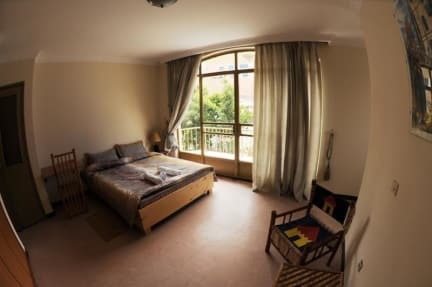 You have found Mr. Martins Cozy Place, one of the top rated and the most recommend budget accommodations in Addis Ababa. It is not a coincidence that we are preferred by travelers from around the world,as we are located only 3.2km from Bole International Airport and our neighborhood is the most happening in Addis in terms of the selection of restaurants, bars, nightclubs, shopping centers,art galleries, banks/ATMs, internet cafes, gyms and cinemas. We are also steps away from easy transport routes to most parts of the city.Mr. Martins Cozy Place is situated inside a quiet, private compound with a two story main building. We have a range of seventeen rooms according to your needs. Our rooms are decorated in simple but tasteful manner and are always clean. Also there is a big communal kitchen for guests to make themselves a healthy meal. To relax, the premises feature a lush garden area and a rooftop terrace with a splendid view in addition to various amenities in order to make your stay hassle free. 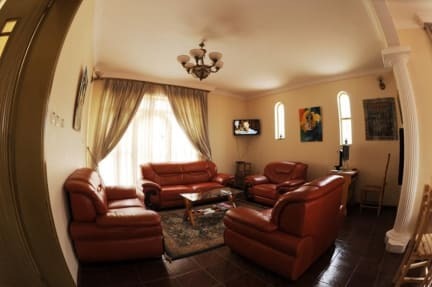 Our experience in budget accommodations since 2005 combined with our friendly staff allows us to make your stay in Addis enjoyable and memorable. We love what we do, we love meeting new people and most of all we love building experience to better our services. We'd a wonderful time with you in Addis - hope I can come back soon!! Es gibt besser gelegene Hotel in Addis Ababa für weniger Geld. Das Internet geht nur in der Hotel Loby.